The worst thing about holidaying in the UK? The weather! You never can rely on when that shy sun is going to peep from behind the clouds – except that it’s bound to happen on the day the kids go back to school. That is the only rule Mother Nature seems to follow. 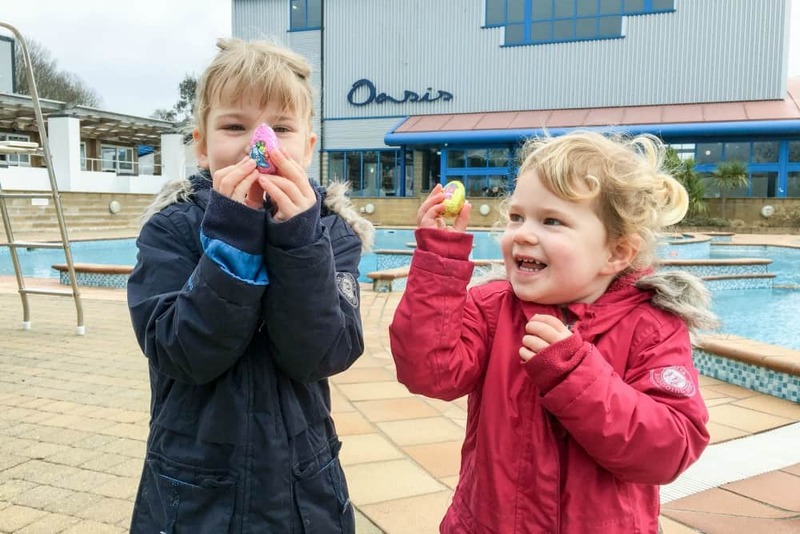 But, regardless of whether it was wet or dry during our Easter holiday at Hendra Holiday Park in Newquay, we had a blast. 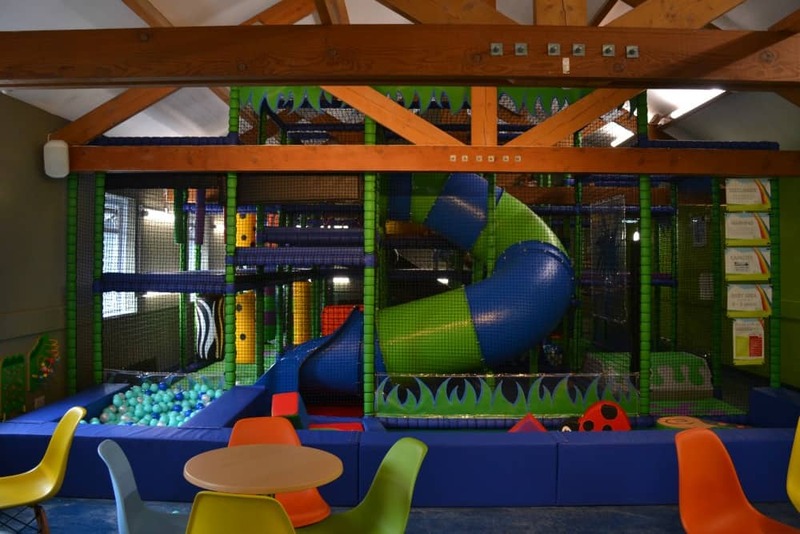 It’s the second time we’ve been invited to review this Cornwall holiday park and it was every bit as fun as last time. 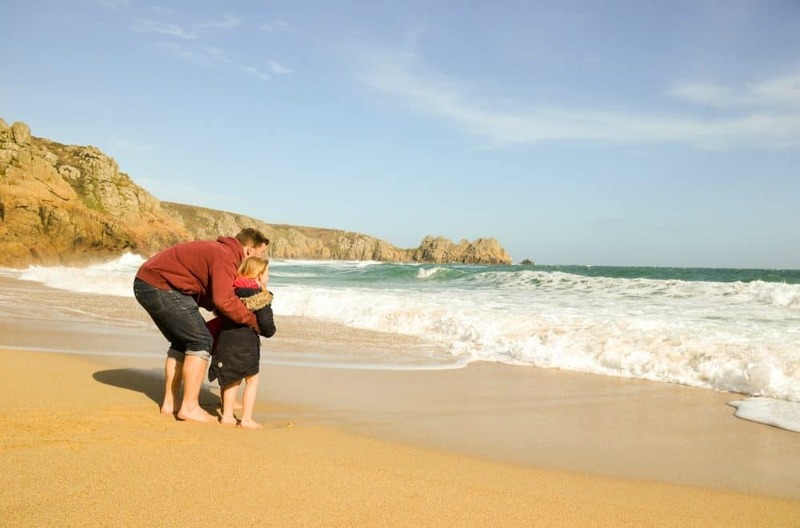 We spent time revisiting the family-friendly activities onsite at Hendra, exploring the local area and chilling out in our Porthminster holiday home which is a few model available to book this year. 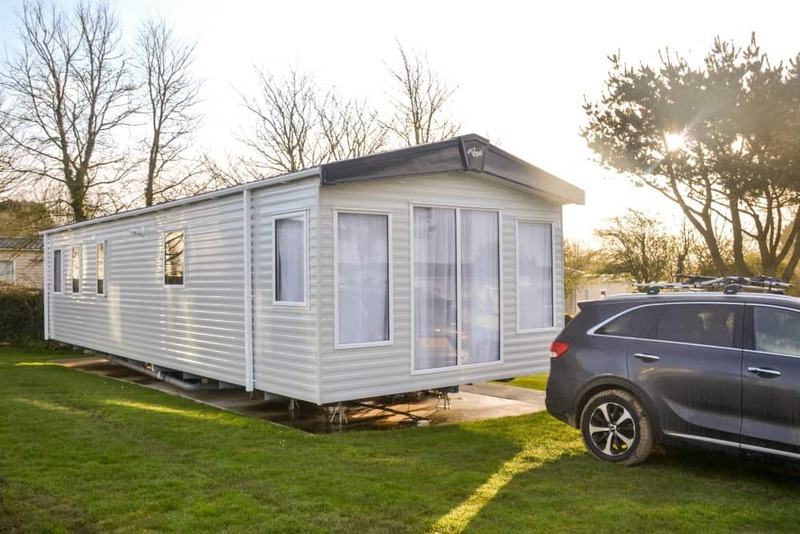 If you’d like to check out another grade of accommodation available at Hendra Holiday Park have a read about our stay in one of their Gwithian premium holiday homes. We arrived on the Saturday of the Easter weekend when the school holiday was in full swing. The park was obviously very busy with plenty of families already bustling around the outdoor play areas and entertainment complex. The ever-friendly reception team directed us to our Porthminster holiday home using a park map and off we went to see what Hendra’s newest accommodation had to offer. We were based in the Cherry Field which was about a five minute walk from the main entertainment complex, pool and shops. It was quiet and had views out over the countryside. Parking was available on grass just outside each holiday home. This was getting a little messy with the poor weather but the grounds team were working hard to mend any ruts. Our holiday home had that brand new smell about it when we opened the door. The seaside-themed decor was stylish and immaculate as you’d expect from new accommodation. The layout in the living area was spacious and the bedrooms were a good size with room to walk between the beds in the two twin rooms and shuffle down the side of the king sized bed in the master bedroom. We had plenty of storage, a small bathroom with toilet and sink, and a separate shower and sink. The three bedroom Porthminster can sleep up to eight people with an extra pull out bed incorporated into the sofa. However, there’s only really seating at the dining table for six people. This wouldn’t be a problem during a sunny holiday when you could sit outside (NB bring your own garden furniture) but things might get snug inside during wetter weeks. As there were just four of us staying in the holiday home space was never an issue. You can also book a two-bedroom Porthminter which sleeps six people and has a larger master bedroom with ensuite bathroom. We had a flat screen TV, DVD player and stereo to keep us entertained when we couldn’t face the rain and could even purchase wifi access from the park. The 4G signal was pretty good at Hendra so we didn’t look into this. It’s not often that we sit still, even if it is raining, but the girls did enjoy a few afternoons of colouring and crafting with bits and pieces that we picked up from the onsite shop. The Portminster comes equipped with cutlery, crockery and kitchen utensils. There’s a full-sized fridge/freezer, hob, oven, and microwave for cooking just like at home. Don’t forget consumables like washing up liquid, sponges, cleaning cloths and toilet rolls. Bed linen is supplied in this premium level holiday home and your beds will be made for you when you arrive. However, you must bring your own towels, pool towels, tea towels and bath mats, which is pretty standard in this type of self-catering accommodation. 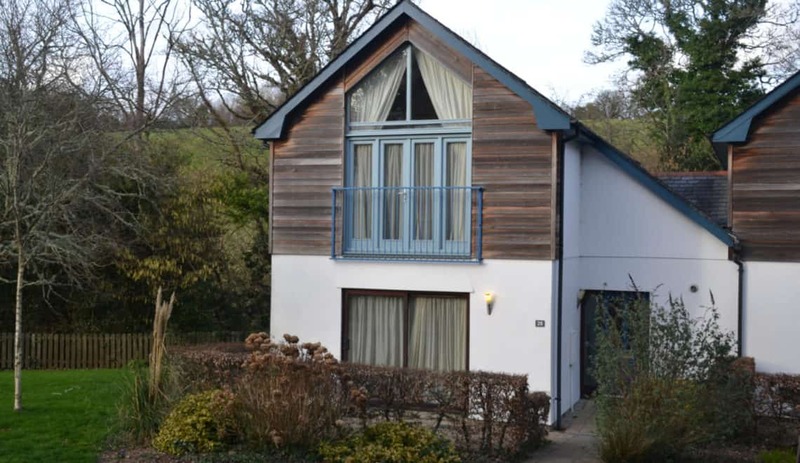 Our seven night stay in this Porthmister holiday home over the Easter holidays would have cost roughly £700, which includes bed linen and access to on site entertainment. There is a lot to do at Hendra Holiday Park even when it rains. The Oasis fun pool was a hit with the Tin Box girls. I lost count of the number of times we went up and down the green slide during our two visits. There’s also the super fast red slide and a more sedate doughnut slide, as well as a lazy river and toddler splash areas. There is a charge for using the pool but if you buy tickets in advance you can get a good discount. Non-residents can also use the Hendra swimming pool, so expect it to be busier on really wet days. We got to there at opening time during the Easter holidays and didn’t have to queue too long for the slides. Another sure-fire kiddie pleaser is the Henry’s Loft soft play area which is free to Hendra residents. There’s a little cafe serving coffees, teas and cakes, and you can jump on free wifi here too. Regardless of what the weather is doing you can always find something fun happening at Hendra. The entertainment team are on the go throughout the day organising crafts, competitions and, during our stay, Easter egg hunts. I have to say that the Easter egg hunt at Hendra was the best organised I’ve seen with lots of eggs for all the kids and activities for them to do while they waited for their turn. There was even a children’s entertainer in The Venue club house to keep everyone amused while each age group was taken outside to get their fair share of the chocolate. Something that our girls loved during our last visit was riding the Hendra Express first thing in the morning. 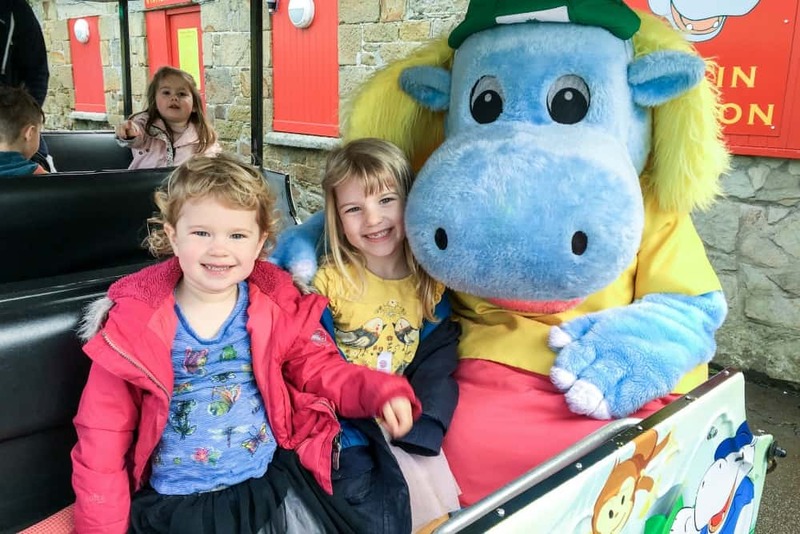 This free land train takes a daily tour around the park with either Henry or Henrietta Hippo – the park’s mascots. There’s always a queue at 9am but the train keeps going until everyone has had a go. Something new we tried during this holiday at Hendra was Adventure School which is free and happens a couple of times during the week. Tot and Baby had a go at erecting their own shelter, lighting a fire and cooking marshmallows. Newquay has a lot of choice: Fistral Beach, Porth Beach and Crantock are among some of the sandy hot spots just down the road from Hendra. We also ventured a bit further afield to Porthcurno which is an hour drive south. Don’t write off the beach if it’s a grey day – you and the odd surfer are likely to have it all to yourselves. There’s also plenty of great cafes to huddle in after a wet and windy beach walk. At Porthcurno we can recommend a pit stop at Portcurno Beach Cafe for hot chocolate and a slice of their delicious and naturally coloured rainbow cake! Sunshine isn’t necessary for a hack around the cycle trails at Lanhydrock National Trust on Bodmin Moor. 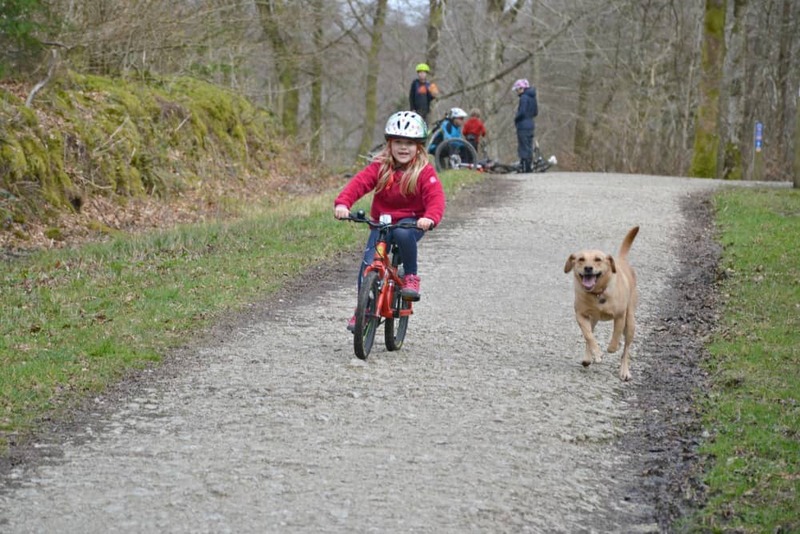 Here you’ll find miles of bike and walking routes as well as skills tracks suitable for advanced riders through to balance bike novices. Dogs are welcome too. If you’re interested in seeing more of the National Trust property then take a look at our post about visiting Lanhydrock House. 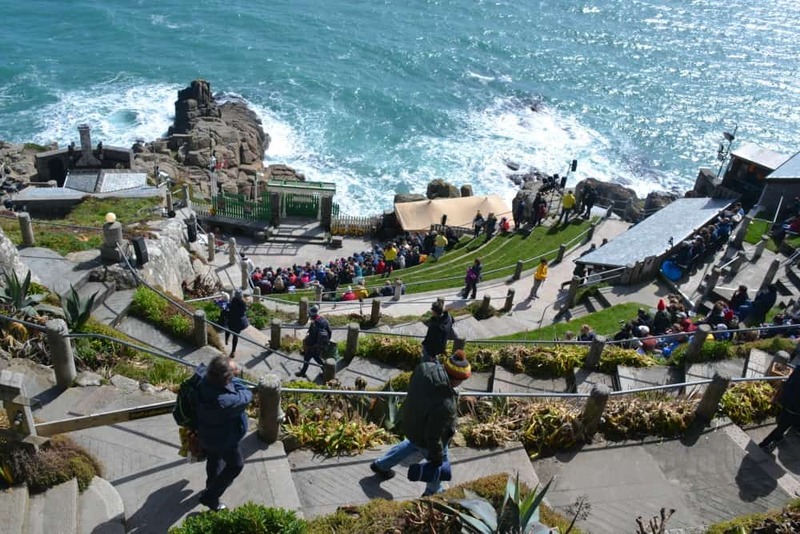 The Minack Theatre on the cliffs near Porthcurno is an incredible place to experience a play. It’s an open air theatre built in the 1930s to create an unique performance space overlooking the Atlantic Ocean. We’ve visited twice with our girls and were lucky to have sunshine both times. However, Minack shows go on regardless of the weather, so wrap up warm, bring several blankets and flask of something hot. As well as seeing plays and storytelling for kids during the school holidays you can visit the theatre and its museum outside the programme of performances. It’s worth it for the views alone. The Minack Theatre is just over an hour from Hendra. Bodmin & Wenford Railway is Cornwall’s only full-sized heritage steam railway and is a fun Cornwall day out come rain or shine. It was a bit drizzly the day we visited, but when you’re riding in the warm carriages who cares? Bodmin & Wenford Railway is 30 minutes from Hendra Holiday Park. Newquay Zoo is a short drive away from Hendra. It’s a small zoo but with plenty to see in a compact area, making it an ideal day out with young children. Make the most of your visit by listening to the keeper talks throughout the day which are announced a short time in advance and easy to relocate to because of the bijou nature of the attraction. Highlights for us included the penguins and warty pigs. Don’t be fooled by the understated exterior of this historic attraction in Porthcurno – it’s a treasure trove in disguise. Plus it’s a great place to head to on a rainy day as most of the museum is inside and underground. The Telegraph Museum tells the story of telegraph communications from the early pioneering projects to lay cables under the ocean to the introduction of more modern communications methods in this quiet corner of Cornwall. There’s plenty of interactive exhibits to bring the story alive for children, plus you can venture underground into World War Two tunnels designed to keep this important communications hub safe from bombing. This National Trust property is Hendra Holiday Park’s closest attraction and is just a few minutes drive away. It’s an Elizabethan country home with lots of outdoor space for kids to let off steam, play medieval games and tackle the grass maze. Trerice house itself only has a few pieces of original furnishings like a long dining table that could have only been made in the dining hall as its too large to remove in one piece. This is where kids can try on suits of armour and play with Tudor toys. This live pirate experience takes visitors back to a time when buccaneers roamed the streets of Newquay, or Towan Blystra, as it was once known. I had concerns about whether the actors and scenery might be a bit too much for five-year-old Tot and two-year-old Baby but need not have worried. We enjoyed finding out lots of trivia about Cornwall’s mythical and swashbuckling past and they enjoyed spotting clues for their treasure trails. The whole experience is indoors and last about an hour. Pirate Quest is located in the centre of Newquay, just 10 minutes from Hendra. 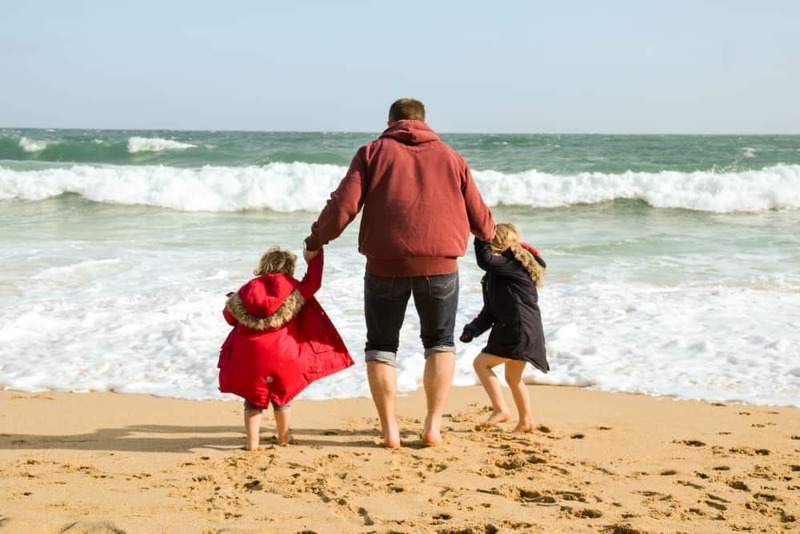 If you’re looking for more inspiration for days out in Cornwall then we love the Suitcases and Sandcastles family travel blog. Claire has some great post about Cornwall’s best beaches and the Lizard. For more ideas about things to do in Cornwall when it’s raining take a look at our wet day guide. 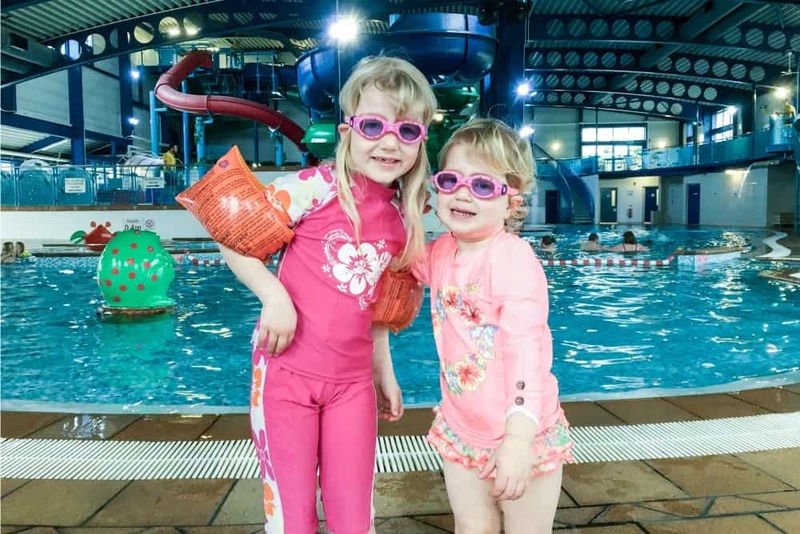 Hendra Holiday Park in Newquay has so much happening onsite and in the local area that you need not worry about the weather or anyone saying that dreaded phrase: ‘I’m bored’. We enjoyed staying in the new Porthminster and feel it’s a really good grade of holiday home – comfortable, modern and well equipped. 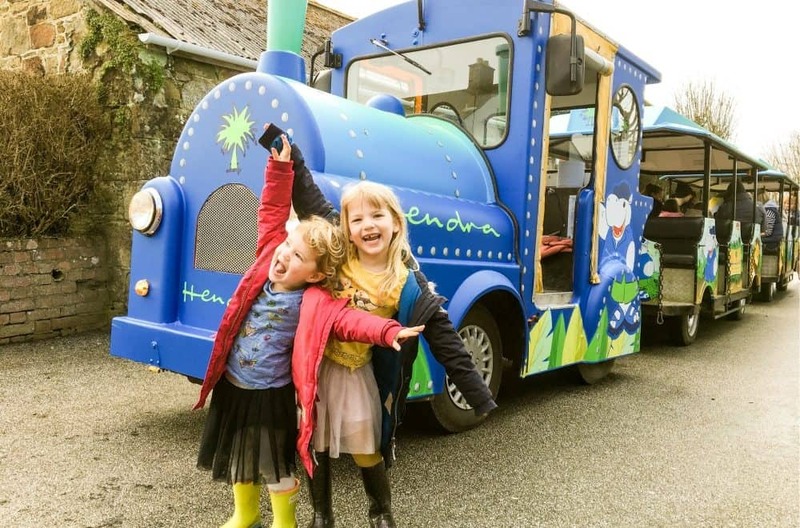 If you’re looking for a Cornwall holiday park that’s great for families then Hendra comes highly recommended. Check out the latest special offers on stays on the Hendra website. Disclosure: we were invited to spend a free week here so we could review Hendra Holiday Park, Newquay. We paid for our own travel but were give free entry to some attractions through Cornwall 365. All views are my own and those of my family. 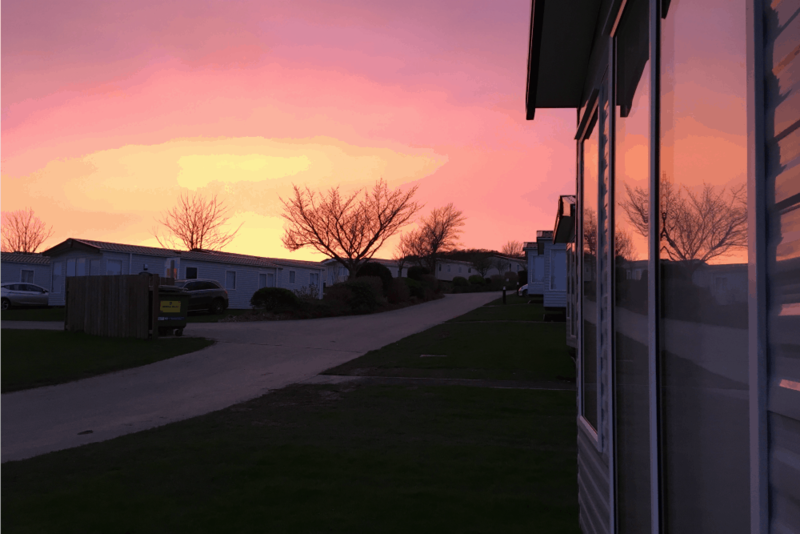 Fancy a stay at Hendra Holiday Park, Newquay? Pin this post for future reference. I’ve never heard of Hendra Holiday Park but I have been dreaming of going to Cornwall forever. Bookmarking this for whenever I visit. Lovely to read this blog while in the middle of trying to find somewhere nice to stay in Cornwall – very timely thank you! Aww, looks like you had such a good time. I visited Newquay too when I was little and remember loving it. I haven’t explored much of Cornwall but it always looks so lovely. I think the The Minack Theatre sounds amazing and something I would love to do if we visit that area. Hendra Holiday Park and the surrounding area makes it look like a perfect place to spend vacation time with a young family. I would definitely look into visiting if I am ever in Cornwall. Gotta love destinations that work in both rainy and sunny days! I went to the Minack Theatre probably over 10 years ago, and I still remember sitting there, just watching the ocean. I loved it there!